I found a tiny gecko today on the fifth floor near the freight elevator. At least I think it’s a gecko. I almost stepped on him. Bending down I discovered he was incredibly cute, so I scooped him up in my empty coffee mug and took him back to my office. I thought he would become an office pet or some such. However, both Janice and Olivia seemed to be frightened of him, so I decided I’d take him outside and release him. I’m not sure what my boss would think if she was here. She’s oddly squeamish about spiders, but I think geckos eat spiders. If, indeed, this is a gecko. I think your little friend is a common house gecko. They’re nocturnal so we don’t see them too often. At my house, they’re particularly fond of hanging around the porch light at night waiting to ambush unsuspecting snack-sized bugs. The pink on your new friend is really pretty. I am not necessarily “afraid” of the creature. I just don’t want him sharing the same space that I do. Especially in the office. He has more space outside than in here with me. Thanks Bart. She would think it was cool, but hope that it could get outside. I actually found one in my office a while back (and knew better that to tell O). With paper I scooped it into a bowl and took it down the elevator to the bushes. How did it get up there I wondered. Now I think somebody might have brought it up! Those things creep me out. I never saw them when I was little, just green lizards. Then, it seemed overnight we had them. My theory is that they are some sort of invasive species. And I hardly ever see the green lizards any more. Haven’t we all had a few more critter experiences post-K? And haven’t we all learned to tolerate critters a little more? I don’t like critters but my cat got a rat, my dog got a squirrel, (sp? I think it’s wrong) I had midges in my house and I now appreciate spiders who catch all kinds of things in their webs. I agree with LisaPaul…I believe it is a young house gecko. When we moved here in July we loved having them around. Unfortunately, the cats have loved them too and the local population had decreased because of that. I have a friend who lives on Guam and has a similar species…he says they are good for keeping the cockroaches in check, which I’m all for. It’s shaped just like the gekkos we had in Shenzhen, except ours were brown when babies, and then green. Yours does look a little thin. I hope he gets to the kitchenette or someplace where he can fatten up. Man, I love those guys. Did you see the article in the NYT about the guys at FAU or somewhere trying to replicate their feet suction to practical use? It’s pretty amazing. Seems to be static electricity and not to rely on any grip per se. I’ve been stunned to see how many I’ve squashed just by closing our back door; they seem to sneak in the jamb at inopportune times. BTW, you weren’t offended by my Hooserleanians comment were you? It was a joke. 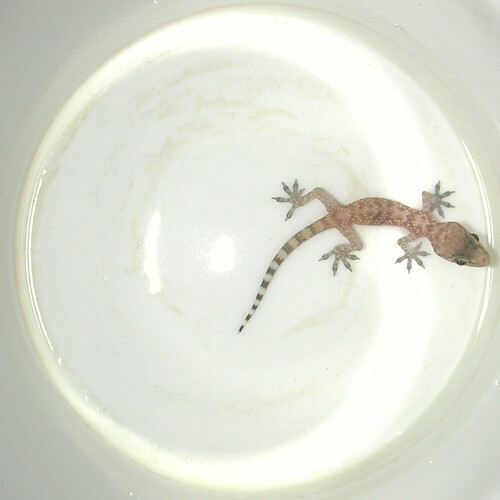 I had ambivalent feelings towards the geckos that lived in my kitchen on Rocheblave, or at times felt they were a little creepy, until one day I happened to see one uncharacteristically leap from the windowsill and collide with a palmetto bug in mid flight. Since that day I have held them in the highest esteem. We have the same geckos in and and outside our house here in Israel. One we especially like visits our living room screen just as we are watching the evening news. The light from the TV illuminates the window, attracting the bugs and our (by now quite) fat friend is right behind — yum, yum, dinner is served. Yours is really thin, I would guess it is fairly young. Try leaving some dead bugs around for it to snack on. I live in La. and those little guys are everywhere under the ceiling of the porch. One has been seen in my bathroom. I hope they are eating bugs however I have not seen any bugs in my bathroom, just that gecko. This is the first season (summer) I have ever seen them.